Operator friendly and easy to manoeuvre range of vertical and drum type aerators. These machines are ideal for relieving soil compaction, allowing water and oxygen to the root zone, improving drainage and helping the turf become drought resistant. The interchangeable tines allow for a variety of aeration methods to be carried out on a regular basis with minimal surface disturbance. Ideal during and out of season. The SISIS Supaturfman is an independently powered heavy duty aerator for sports field maintenance, grass lawns and amenities. It is ideal for maintenance as a bowling green aerator and a cricket aerator. It has a maximum working depth of 10cm (4 inches) and a choice of interchangeable tines to provide excellent lawn care when aeration is needed. 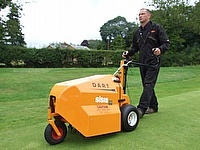 The SISIS Dart is an independently powered vertical action aerator ideal for sports field maintenance as well as grass lawns and amenities. 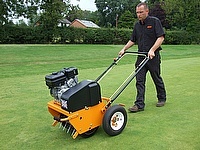 It is ideal for maintenance as a bowling green aerator and a cricket aerator..